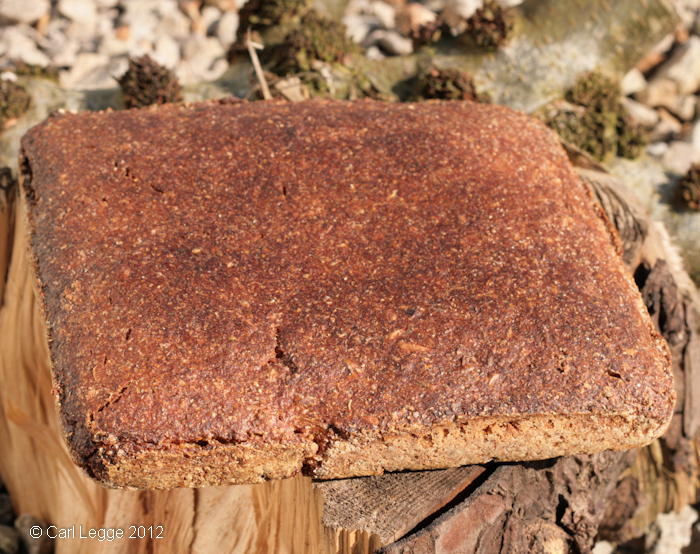 In my goody box from Anne at the Felin Ganol Mill was some wholemeal rye flour and chopped rye berries. Along with some sunflower seeds, these are just what you need to make this delicious, hearty & earthy bread. 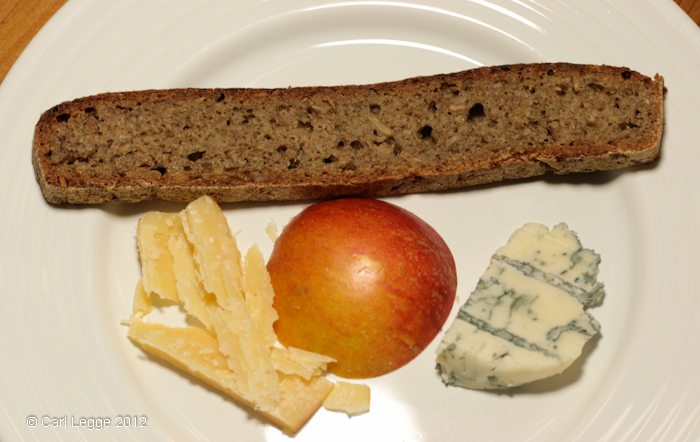 The result was fantastic and we ate it with some very special cheese. The soaked rye chops help keep the bread wonderfully moist. Those and the sunflower seeds mean it also has a nutty texture. The bread is easy to make as long as you do not expect the same feel and process as making bread with wheat flour. 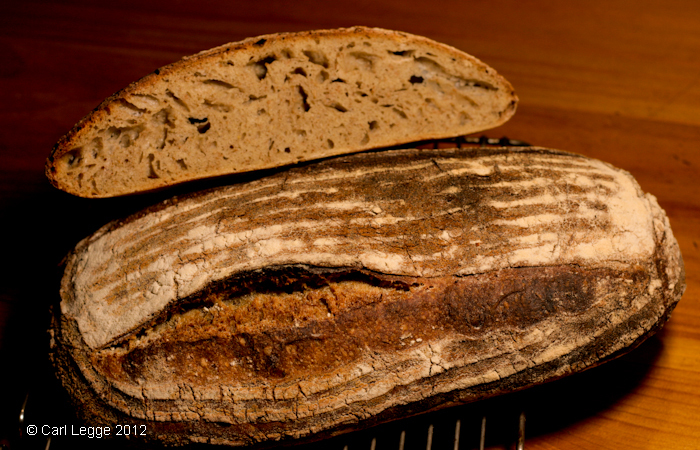 Rye doesn’t have the same gluten development as wheat, so you don’t get a big rise. The dough starts, and remains, sticky and so you have to handle it sparingly with wet hands. It’s also best to ‘age’ the bread once it’s made for 24 hours or more so that the crumb can develop the proper characteristics. This meal started off as one of those: “What do I do with these?” scenarios. Debs had made a gorgeous parsnip, cinnamon and lemon cake with some of our over-wintered parsnips. It was delicious. I had one parsnip left that Debs had not been able to use. And I had cleared a space in our big polytunnel for a new kiwi ‘Jenny’ and for our tarragon. 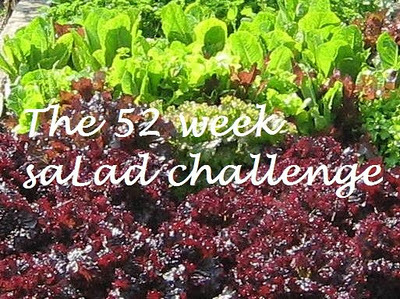 (How posh is that, to have a big and a little polytunnel?) The space for these had a huge clump of chickweed in it that we’d been harvesting for ages. And, of course, it’s wild garlic time. So I thought that the parsnip would make a really intense sweet/savoury mash with potatoes and wild garlic pesto. It did. I gave the chickweed a good haircut. Then I just washed it, gave it a good shake and wilted a 2 litre pan full, covered and shaken for 2-3 minutes. I dressed it with my normal vinaigrette. I brushed the seafood with a little harissa and griddled it on a very hot ridged griddle for about 4 minutes. I then turned the heat off and covered with a saucepan lid to leave it to cook in the residual heat and steam. 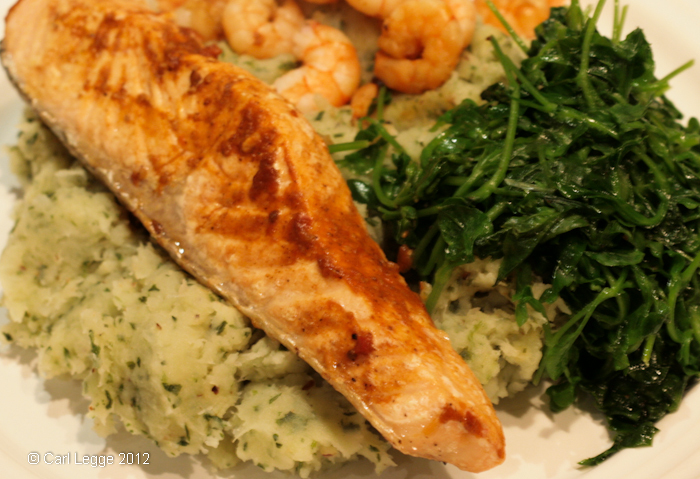 The whole recipe took less than 30 minutes to prepare and had a lovely contrast of colours, flavours and textures. The first nettles of the 2012 season for us. 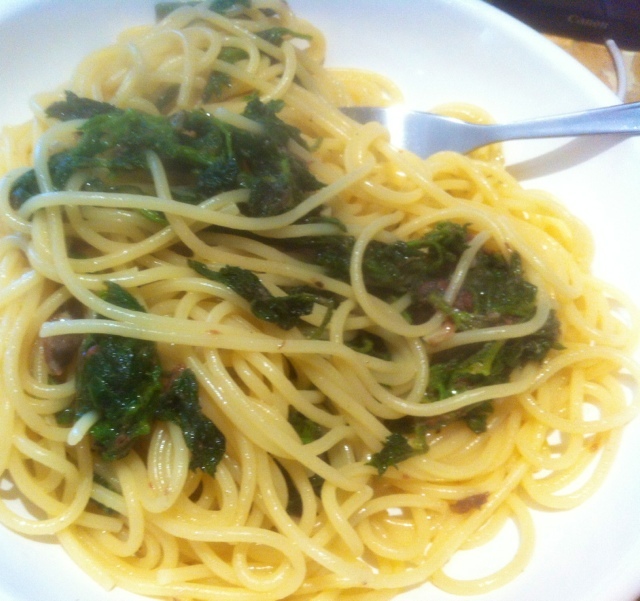 While the spaghetti cooks, gently fry garlic & anchovies in extra virgin olive oil. Then add nettles to the pan and cover till they wilt. Season with salt, ground black pepper and lemon juice. Mix through lightly drained spaghetti with a good handful of finely grated Parmesan cheese. Delicious! Now why would you name a wheat after someone who would say that? I think this Particular Tybalt, unlike Romeo’s assailant, is more fiery in name than in nature. 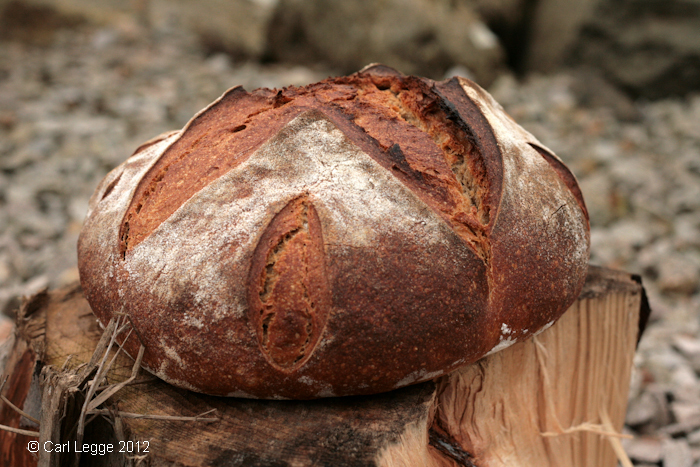 This is another test bake of one of the flours I received the the Felin Ganol Mill. This particular flour is a fine grained white flour. I decided to use is as part of my normal bake of 2.7kgs of sourdough along with some Felin Ganol wholemeal spelt. Anne & Andrew say on the packet that they recommend it is mixed with 30% strong white flour. What I did was replace some of my usual strong white bread flour with the Tybalt. 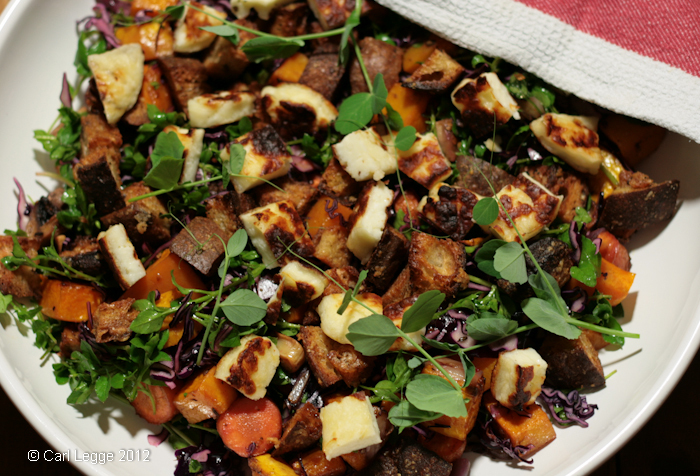 I promised some more salad dressings when I wrote the Vinaigrette recipe the other day. I really looked forward to doing this post because mayonnaise this way is so simple and so spectacular. You’ll have great mayo in less than a minute. I hope once you have made this the first time, you will not feel the need to buy mayo ever again. What’s more, it gave me an excuse to make a food-related video to show you how easy it all is. So it was lucky I needed some mayonnaise yesterday. It was to make into a wild garlic mayonnaise to go with some juicy prawns grilled with breadcrumbs and parmesan. I’m afraid there’s no picture of the finished dish because we ate it! The day started a bit murky here. And certainly further along the coast where we were for the main part of the day, the murk didn’t properly clear. This evening, on the end of the ‘Dragon’s Tail’ that is the Llŷn Peninsula we’re in a bowl of cloud. 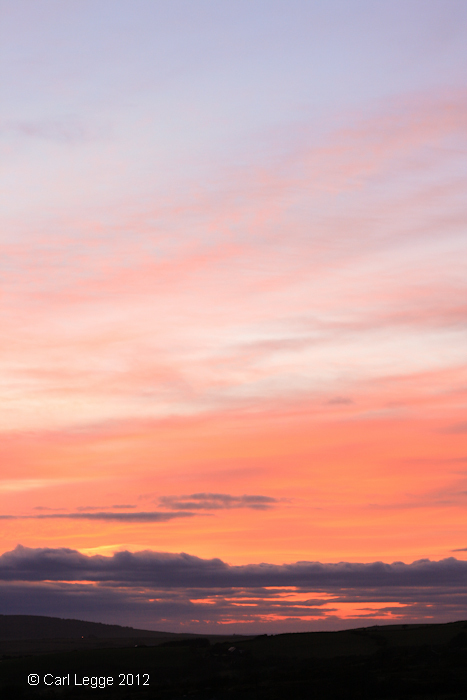 Facing west, we have this beautiful sunset. A joy to behold. It’s very funny how life works. I nearly met Anne & Andrew Parry from Felin Ganol Mill last year. We were temporarily in the same room and then I had to leave the next day. That was at an ‘international’ meet up of bakers in Bethesda, North Wales. Love of bread (and food in general) led me to become online mates with Azelia Torres-Martin. If you look at her blog, you’ll soon find out that Azelia is a bit of a flour geek. Azelia came across the Parrys through her flour researches. She introduced me to them virtually (over t’internet) because she thought we had similar values and ideals about life. And after a brief email exchange with Anne, I now have a big box of different flours to try from Anne & Andrew’s beautiful mill. That says a lot about their approach to life and to their craft. In exchange for some free flour, they asked for feedback about it from someone who bakes a lot and knows a bit about what they feel & taste. Now I’ve not achieved the levels of geekery that Azelia has, but I do bake quite a bit and enjoy the challenge to learn about new flours. This is a review of the first flour I tried. It’s milled from a 100% ‘Amaretto’ wheat variety grown by Howard Roberts in Hammonds End Farm, Harpenden. It’s at 70% extraction, which in baker speak means it has only 30% of the wholemeal bits removed. The flour is from the 2011 harvest and has a protein content of 12.3% for those that are into such things. 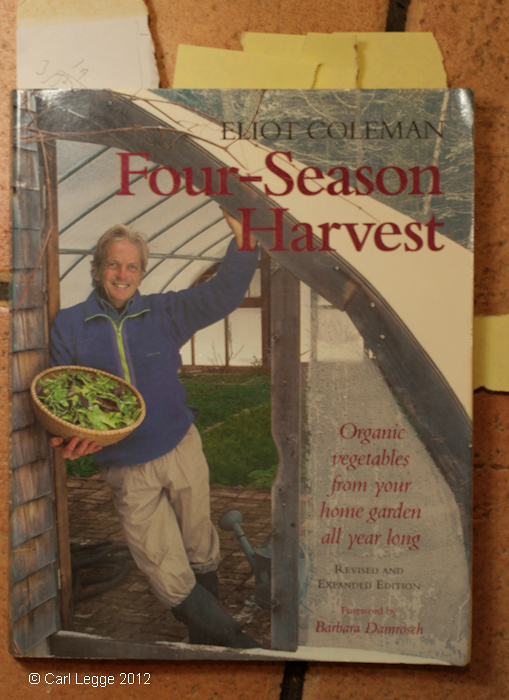 Eliot Coleman: Four Season Harvest – Organic Vegetables from Your Home Garden All Year Long. Revised & updated edition. Four Season Harvest is a book about “extending the harvest season not the growing season”. In the words of Coleman’s wife Barbara Damrosch in the Foreword: “It’s about gardening and eating in a manner appropriate to each season”. These are sentiments close to my own values to use food that is fresh, seasonal and local. This was one of the first books we bought on this subject and it has stood the test of time against newer publications. Eliot Coleman is a leading proponent of organic gardening and farming as well as being an author. He advocates working with nature and the soil using simple and effective techniques. He lives and gardens in Maine, [state], USA. This is an edition of his 1992 book revised in 1999 after a research trip to France. There Coleman & Damrosch ‘re-discovered’ knowledge of year-round growing and harvesting from French gardeners. This edition contains great advice and inspiration from this source. The story of their French trip unfolds wonderfully throughout the book and is an inspiration. Four Season Harvest is well designed and laid out in two column format. Kathy Bray’s black & white illustrations are beautiful and helpful. 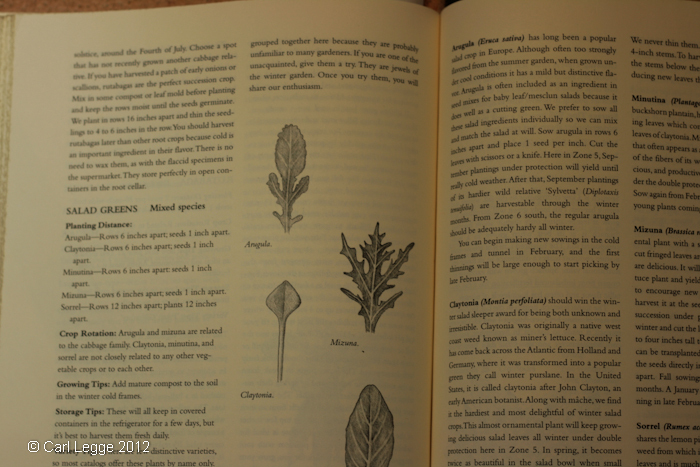 There is a colour inset section in the middle of the book which contains useful photographs taken by Damrosch. 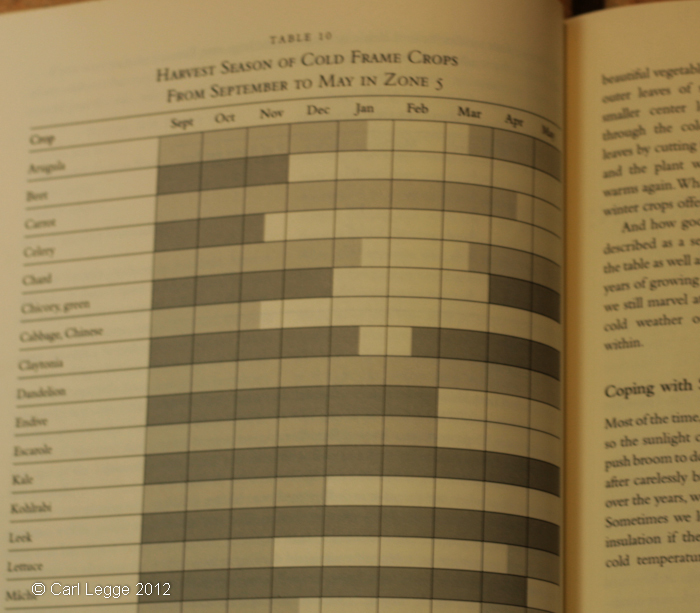 In the first two Chapters Coleman makes the case for the all year round harvest. He advocates not just that you extend the summer harvest into late-autumn, but that you should plant cold tolerant crops too. He usefully explains how your latitude, day length and temperature will affect what will germinate and grow. 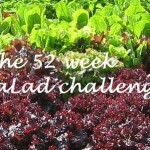 He then outlines how to begin to create a productive garden that is also a place for you to live and work in happily. In the next three chapters Coleman takes you through making compost to feed your garden, how to assess, plan and prepare your plot and where to source seeds from both conventional and ‘alternative’ sources. He then explains how to do outdoor gardening and suggests ways to use ducks as garden helpers. 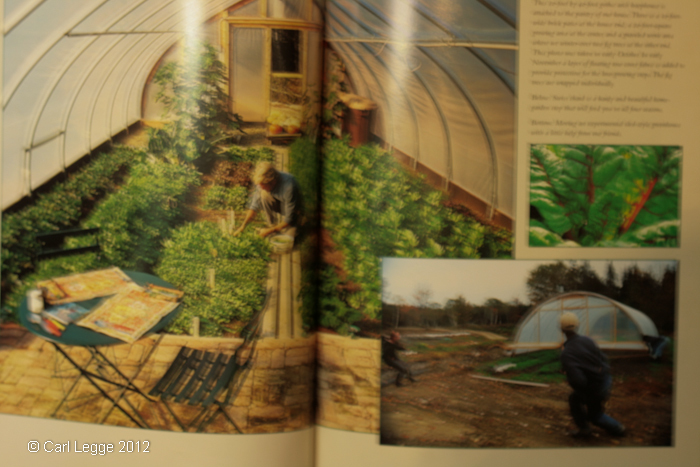 He describes the contribution of covered gardening if you use greenhouses, polytunnels, cold frames and cloches. These contain detailed explanations and he delivers lots of useful advice and experience. 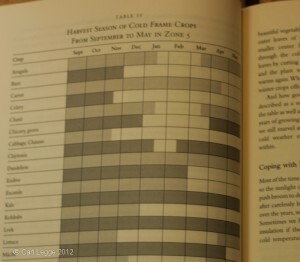 He includes a number of useful tables to help with planting and cropping dates and sequences. 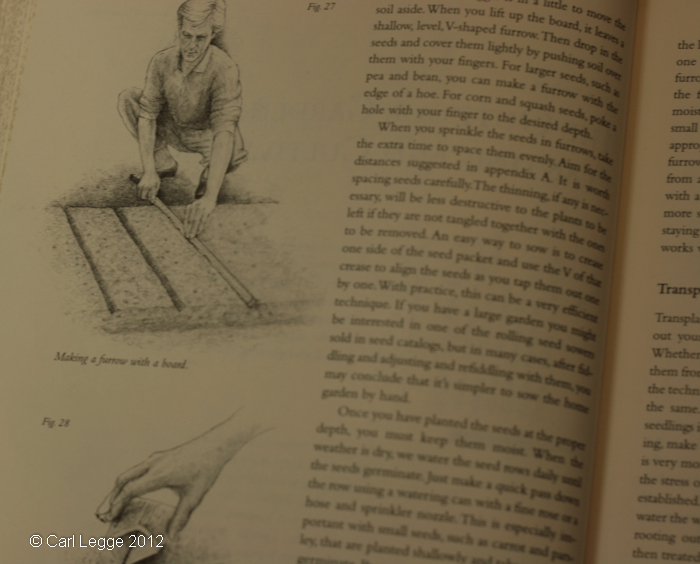 Chapter 11 is a really useful chapter about the ‘Indoor Harvest’. He tells you about how to store root crops in cellars or clamps and producing shoot harvests by ‘forcing’ vegetables. He also gives some basic information about how to dehydrate your produce to preserve it. 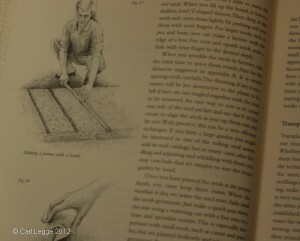 In Chapter 12 he explains about what he calls ‘Balanced Gardening’: methods using organic principles and polyculture. The four Appendices are a mine of useful information. 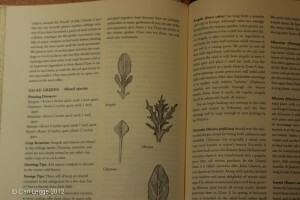 Appendix A gives extensive details for a range of plants how to plant, cultivate, harvest and store them. Appendix B contains resources about climate and temperature. The last two appendices discuss the ecological impact of plastic in the garden and gives information about sources of supply and tools. There is an extensive Bibliography and comprehensive index. The prose is clear and the descriptive passages evoke and emote his love of his garden and of the French gardens. This book is clearly a distillation of many years careful and thoughtful study around the world. Coleman writes mainly from a United States perspective but there is good data for Western Europe. I think there is enough information for the knowledge to translate well to other parts of the world. This is a book that we continue to go back to for reference and inspiration year after year. I don’t think it is so comprehensive that it should be the only text on your bookshelf on this subject. I do, however, think it’s an essential read. A perfect end of daylight on our 23rd Wedding Anniversary. A gorgeous sunset. 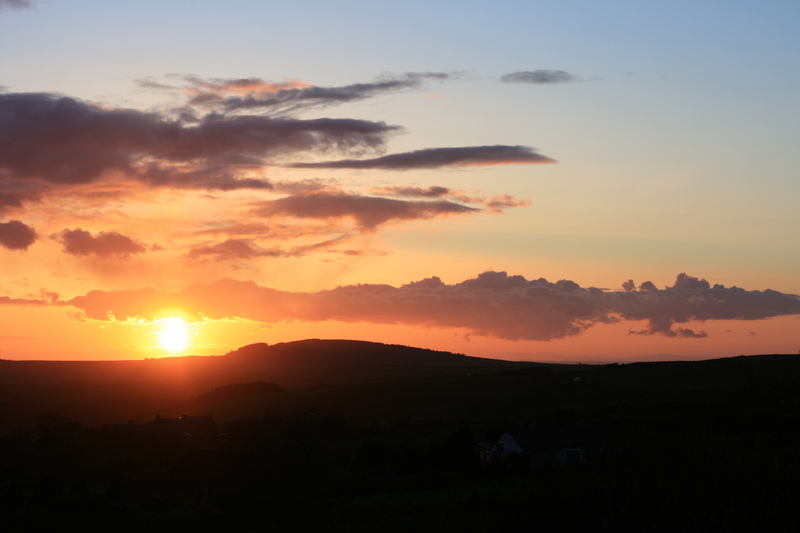 On the horizon on the right you can just see the silhouette of the Wicklow Mountains in Ireland. They’re a good 60 miles away, so the visibility is good.